Israel has been all over the news lately. They are having a tough go of it. Hamas has been barraging them with rocket fire. The entire militant, terrorist community is out to get them. In times like these, we must support Israel. Why? 1. Israel is God’s covenant people. God Himself chose Israel to be His personal inheritance. His covenants were originally made with the Jews… not with anyone else. When Jesus came, God through Jesus Christ made a way for Gentiles (non-Jews) to be grafted in to Israel. Basically, that means that God started considering every believer in Christ to be a Jew. (Jesus was a Jew; we are dead to ourselves and Jesus is alive in us; that makes us Jews too.) By making a way for all Christ-followers to be considered Jews, God made a way for us to be part of His covenant too. That is huge. That means that we owe everything to the Jews, and the apostle Paul actually tells us so in Romans chapters 10 and 11. We do not stand on our own. We stand in Christ because God grafted us into the covenant He made with the Jews. The Jews are still the original inheritors of His covenant, and they will be saved from sin through faith in Christ in the end. 2. God will bless those who bless Israel and curse those who curse her. I don’t want to be on the receiving end of God’s curses, do you? I want to be blessed. God blessed Abraham and his children with extreme blessings: wisdom, intelligence, financial provision, and everything else you can think of. I want to be blessed like that. So I’m going to bless Israel. Pray relentlessly for the peace of Jerusalem and all of Israel. Vote for politicians that will insist that your country support Israel: in her political decisions, in her right to be a state, in her ownership of the land, in her sovereign right to the Temple Mount, and in humanitarian and military aid. Protect people you know in your neighborhood from anti-Semitism. Refuse to participate in anti-Semitism. Help humanitarian organizations that are assisting Jews all over the world. You may not realize it, but some of the poorest and most elderly people in under-developed countries (e.g. Russia, the Ukraine, Africa) are Jewish. Many of these elderly people live on little food and no heat, and sometimes no food at all. You can bless the poorest of the poor of God’s covenant people by supporting organizations that give them food, shelter, and help pay their utilities! Help Jewish people make aliyah. “Aliyah” means a Jewish person who lives somewhere other than Israel immigrates to Israel to live there permanently. The Bible prophesied that the Jews of the Dispersion would someday go home. (That is part of end-time events.) It’s easier said than done, though. Not only does it cost money, but the immigrants also need help to learn the Hebrew language and customs, as well as finding a way to support themselves in Israel. Humanitarian organizations such as Bridges For Peace help Jews make aliyah successfully every year. 3. I’m in love with a Jewish Man. I’m madly in love with Jesus Christ, who was fully human and 100% JEWISH. Jesus was a Hebrew. I know churches have lovely paintings on their walls depicting Jesus as a Caucasian guy, but He wasn’t. He was Jewish. So if my Lord, Bridegroom, Savior, Redeemer, and Covenant Friend Jesus was Jewish, how can I fail to love the Jewish people? Think about it this way: Let’s say you’re Scottish or Indian or Nigerian, and you married a spouse from China or Mexico or Brazil. All of those cultures and peoples are as different as night and day. But wouldn’t you grow to love your spouse’s culture? Wouldn’t you teach your children about the culture of your beloved? Of course you would. You would visit the nation of your spouse, hang art on your walls from their country, and maybe even learn to speak their language. You would study their customs and celebrate the beauty of their ethnicity and background. Well, for Christians, it should be the same for us with the Jewish people and with Israel. We should love them, protect them, honor them, study their culture, and learn everything about them we can… because we’re in love with a Jewish Man, the Son of Man, King Jesus. I love Israel. I love the Jewish people. I desire to support them in every way I can, and according to the Word of God, you should too. 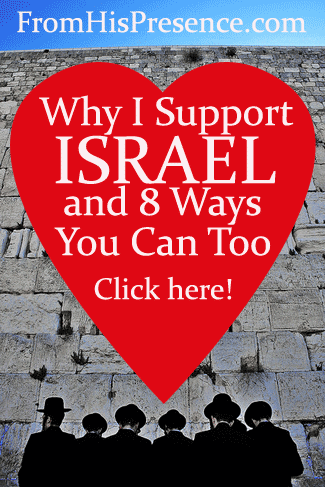 What can you do to support Israel today? Image courtesy of Edoardo Costa on Flickr via Creative Commons license. Great Article!! I love and support Israel too..they are the Apple of God’s Eye, and as you say our Beloved Bridegroom Yeshua is Jewish..as are the Apostle’s, the Prophets and the Patriachs.Our Saviour and our Bible came through this special race. I support ‘Operation Exodus’, who give humanitarian aid to the needy Jews in the diaspora, and also help to bring many home to Israel. Yes! They are! Thanks for reading, Sue!